The truth about throw bags, is that while they are one of a rescuer’s most valuable tools, they can also be a dangerous and deceptive weapon. 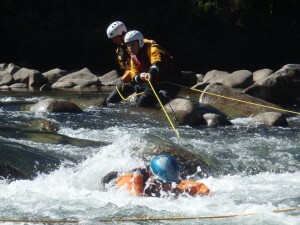 While there is much discussion amongst Swiftwater Rescue professionals about type of rope, whether or not to have a loop on the end of the rope, and how to do “coil tosses”; quite frankly not enough attention is given to the responsibility a rescuer has to both himself, his teammates and the victim to think, and have a plan BEFORE the rope is thrown. Swiftwater Rescue is about finding a quick, safe, and efficient way to access someone in trouble, and transport them back to shore. While a hands on technique via wading, paddling a boat, or reaching a victim with a paddle or pole, is always a preferred method; when this type of access is not possible, we often times rely on “ropes”; especially “throw bags”. There is much more to accessing someone with a throw bag than just getting them the rope. A plan must be in place that considers ALL of the following, the ability of the rescuer to get the rope to the victim, what happens when the victim grabs the rope, how to get the victim to safety with the rope, and whether or not the victim (and the rescuer) can hold onto the rope. There is much debate about whether or not to put a knot and loop in the end of a throw bag, or to maintain a “clean end”. 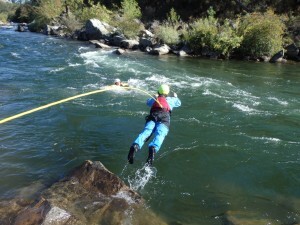 This debate focuses on the potential for the rope to snag if it is “released” into the river or flood zone. A loose rope in the water, is an evil servant looking to wrap around props, arms, legs, trees, and create all sorts of EXTRA hazards. 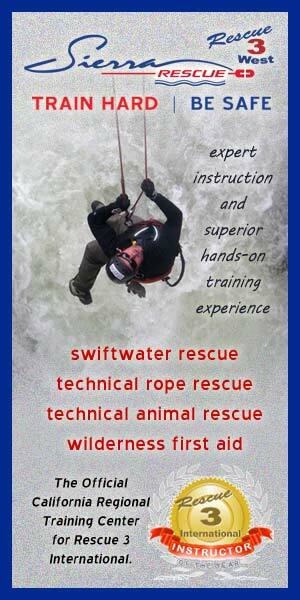 The emphasis should most importantly be on the understanding that a rescuer must NEVER let go of the rope. This can be accomplished with preplanning, practice, and an advanced understanding of how to deploy the rope dynamically, and with a plan for “landing” the victim in a safe area. 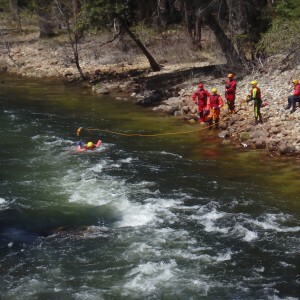 Too often, news videos catch rescuers releasing their ropes into the flood or river zone when something goes wrong, thus further endangering the victim and potentially other rescuers. Sometimes, due to unexpected forces, there is a rescuer attached to the throw bag via a live bait jacket. Now, both a rescuer, and a rope, are traveling downstream together in a potentially disastrous situation. Attention needs to be given to the limitations of a throw bag, as well as the potential. If a rope is thrown to someone, than we must be sure that we have a steady plan for what happens if they reach for the rope, or grab onto the rope. If we don’t, we actually have the potential to destabilize a situation. If someone is out of the water, and on top of a car, we need to be sure that reaching for the rope, and entering the water, actually puts the victim in a safer environment that when they were breathing, and not IN the water, while on top of the car. Throw bags have been used to stabilize kayakers and extract them from very treacherous situation. They have been used to safely pendulum folks into an eddy who would have otherwise had a long and tough swim. Throw bags have been used as tensioned diagonals to transport gear and people off of islands, and to a safe shore. They are one of our absolutely most useful rescue tool when we can not make hands on contact with a victim. It is still just as important to know that without thinking, and having a very specific plan, there is potential for a throw bag to actually make a victim’s situation worse.